A sharpened pocket knife is imperative for safety and control as well as for function. A dull knife blade can slip and cause an accident when more pressure is put on it in an attempt to cut. A best pocket knife sharpener is necessary to ensure your blade is always ready when you need it. 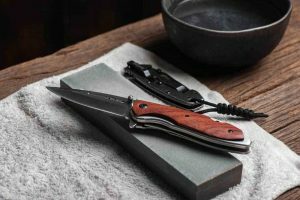 Portable pocket sharpeners are convenient although electric countertop models are versatile for more types of knives than just those used outdoors. Hand sharpening using a whetstone lubricated with oil and water is the traditional method used to sharpen any outdoor knife. They are compact, lightweight, and portable. Many are dual-sided, having a coarse grit side and a fine grit side. There are also diamond, ceramic, and carbide pocket sharpeners. Electric knife sharpeners are not portable and they are more expensive. But they sharpen your blade quickly and to a razor-like edge. Knife sharpeners are compared according to their type (bench stone, electric, etc. ), their sharpening surface/abrasives, and their sharpening angle (Typ. 15 deg., 20 deg. etc.). Pocket knife sharpeners are also rated according to their weight and portability. 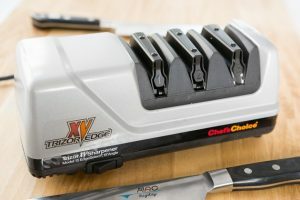 The easy, countertop Chef’sChoice 15 Trizor XV EdgeSelect Professional Electric Knife Sharpener is a precise, durable, knife sharpening unit designed to sharpen any knife blade to a high-performance, 15-degree razor edge, regardless of its original angle. Its patented flex spring guides accurately control the sharpening angle. The 15 Trizor XV EdgeSelect professional electric sharpener’s 100% diamond, 3-Stage EdgeSelect® flexible abrasive system offers to sharpen, honing, and advanced stropping and polishing to extend the life of your knives. It effectively converts household 20-degree kitchen blades, for example, into high-performance 15-degree razor-edges. This 15 Trizor XV EdgeSelect professional sharpener is versatile electric knife sharpener that sharpens all blades, from thick to thin, from straight to serrated, to a 15-degree edge. It bevels a razor edge on the pocket, hunting, thin fillet, and chef’s knives, as well as serrated bread knives. It takes approximately one minute for first-time sharpening and approximately 10 seconds for re-shaping. This electric knife sharpener is made in the USA and comes with a 3-yr. limited warranty. First stage converts ALL blades to 15 deg. This compact, pen-shaped Victorinox Pocket Knife Sharpener is a sturdy, portable knife sharpening tool designed by the well-known (Swiss Army Knife) brand for pocket and multi-facet knives/tools. It is a lightweight, convenient, carry-in-your-pocket sharpening tool. The Victorinox pocket knife sharpener is an enclosed ceramic sharpening system that includes a pre-sharpening honing stone and ceramic discs for fine-finishing edges. 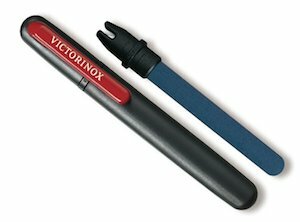 The V-shaped notch and ceramic rod finisher are contained in a durable plastic pen-shaped case that fits on your belt or in your pocket. It effectively sharpens the serrated portion of your pocket knife as well as the straight blade edge. This Victorinox pocket knife sharpener sharpens fish hooks as well as straight and serrated blades. Victorinox AG guarantees its stainless steel knives and tools. This pocket knife sharpener comes with a lifetime warranty against material and workmanship defects. Damage caused by misuse or normal wear and tear is not covered. The Dianova FNDC4 Combination Whetstone Knife Sharpener is a high-quality, extremely lightweight, portable, double-sided whetstone that includes its own leather slip pouch for carrying. It serves as a convenient pocket field sharpening tool and the stones remain flat even as they wear. The Dianova FNDC4 sharpener has one side that is diamond (25 micron grit) for sharpening and the other side is smooth ceramic for finishing. These materials will sharpen any steel without the need for (oil or water) lubrication. They are easy to use and easy-clean. Due to its compact size, this whetstone works best on smaller pocket/survival knives or those having blade lengths less than 4.5 inches. It effectively sharpens pocket knives and fixed blades, scissors, and fish hooks! The compact and portable countertop SunrisePro Supreme knife sharpener is a precise, perfectly-calibrated knife sharpening unit designed to sharpen any knife blade to an optimal 20-degree razor edge. It is a manually-operated design that affixes to any countertop using an advanced patented non-slip suction base. Simply remove it and store it in your drawer when you’ve finished using it! 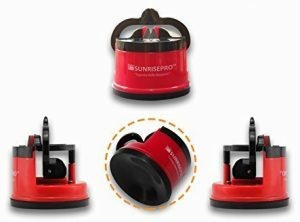 The durable SunrisePro Supreme knife sharpener’s natural tungsten carbide technology makes it harder and longer-lasting than hardened steel. It sharpens the most expensive knives and serrated blades to precision point accuracy. This streamlined SunrisePro Supreme knife sharpener includes a safety ergonomic handle that is well-suited for either right- or left-handed users. 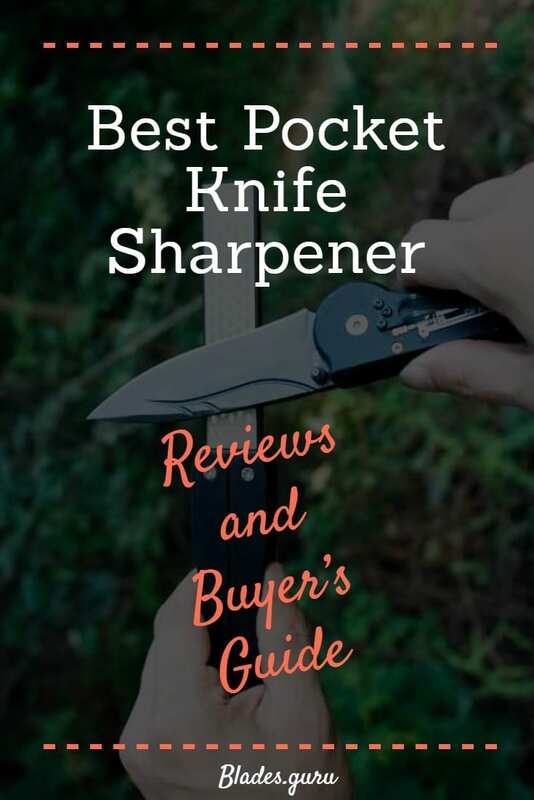 It perfectly sharpens all types of blades to a razor-sharp edge from pocket, camping, and hunting knives, fillet and chef’s knives, to butcher, boning, and bread knives. It takes approximately “three swipes” and two seconds to sharpen your knife using minimal effort. It is not recommended for sharpening very fine-toothed serrated knives, however. The Lansky PS-MED01 BladeMedic knife sharpener is a precise, durable, portable knife sharpening tool designed to sharpen any knife blade to a pre-set 22.5-degree edge. It is a convenient, metal-cased, carry-in-your-pocket sharpening tool. The PS-MED01 BladeMedic knife sharpener has four separate sharpening stones in a full-metal housing. It includes a V-shaped tungsten carbide stone that removes nicks and restores your knife blade in just 3-4 swipes. With another 3-4 strokes the V-shaped ceramic sharpening stone de-burrs and polishes to a finished edge. The ceramic serrated sharpener sharpens even the finest-toothed serrated knife edges. There is also a retractable diamond (600-grit) re-conditioning and maintenance sharpening rod. This compact PS-MED01 BladeMedic knife sharpening tool neatly fits on your belt or in your pocket. It also has a hole for a lanyard. It bevels a razor edge on the pocket, hunting, and fishing knives, serrated blades, gut hooks, and more. All Lansky products offer a manufacturer’s warranty. 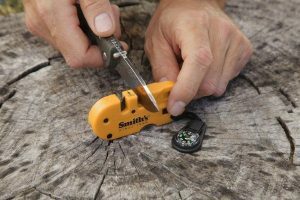 The Smith’s PP1 Pocket Pal knife sharpener is a lightweight, durable, multi-function knife sharpening tool designed to sharpen any knife blade to pre-set angles for precise edges. It is a convenient, pocket-sized field sharpening tool. The compact PP1 Pocket Pal knife sharpener has three separate sharpening stones in a durable lightweight housing. It includes a V-shaped coarse carbide stone that aggressively removes nicks and quickly resets your knife blade. The V-shaped ceramic sharpening stone de-burrs and polishes your knife blade to a finished razor sharp edge. Carbide and ceramic stones are reversible and replaceable for maximum usefulness. There is also a retractable tapered diamond-coated (400-grit) rod for sharpening serrated as well as straight edges. This compact PP1 Pocket Pal knife sharpening tool neatly fits onto your belt or in your pocket. It also has a hole for a lanyard for safe carrying. The PP1 Pocket Pal is an essential field tool for sharpening dull or damaged pocket, hunting, hiking, camping, and fishing knives, serrated blades, and more. 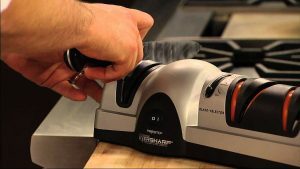 This countertop Presto 08810 EverSharp electric knife sharpener is an easy-to-use, three-stage, professional sharpening tool that takes the guesswork out of sharpening. Its interchangeable blade guides (thin, medium, thick) automatically and securely hold your blade at the optimal sharpening angle. It allows you to get professional sharpening results at home. The quiet Professional EverSharp electric sharpener’s three-stage abrasive, rotating-disc, sharpening system provides sharpening, honing, and polishing that helps extend the life of your knife. Stage 1 sharpening includes a Sapphirite coarse-grinding disc that removes nicks and resets the blade to the desired angle. The Stage 2 Sapphirite medium-grinding wheel sharpens your knife blade to a precision edge. The Stage 3 extra-fine-grit ceramic wheel polishes the blade to a razor-sharp edge. This professional-grade home electric knife sharpener bevels a razor edge on the pocket, hunting, kitchen, fillet, and chefs and Japanese-style, bread knives, and more. It only requires 3-5 pull-throughs per stage to sharpen, hone, and polish any of your dull pocket, hunting, kitchen, or other knives. No other skill is required! It also comes with a 1-yr. limited warranty. 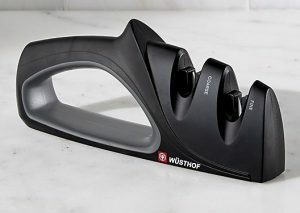 The handheld Wüsthof knife sharpener is a safe, easy-to-use, dual-stage knife sharpening unit designed to grind any knife blade to an optimal razor edge in just a few pull-through strokes. The Wüsthof knife sharpener is a portable, manually-operated tool that you place on a flat surface, hold it with one hand, and pull your knife through with the other. The knife blade is fully inserted into the notch at a 90 deg. angle and pulled back (toward the user) to sharpen. The durable, V-shaped knife sharpener’s Stage 1 hard carbide steel cutting head blades provide coarse sharpening that quickly restores an edge. After setting the knife’s edge with the carbide side, use the unit’s ceramic side to nicely finish the edge. Stage 2 honing and finishing is accomplished by inserting your knife blade into the fine ceramic plate slot and pulling it back several times to sharpen. This Wüsthof knife sharpening tool has a rubberized base and molded, E-Z-grip, safety handle that is well-suited for either right- or left-handed users. It sharpens all types of blades including pocket, camping, and hunting knives, fillet and chef’s knives, to butcher, boning, and bread knives. It is not recommended for sharpening scissors. This advanced hybrid countertop Chef’sChoice 220 knife sharpener is an easy-to-use two-stage combination electric and manually-operated sharpening tool. Its electrically-powered stage sharpens. Its manual stage hones your knife to a burr-free, razor sharp edge. Durable, brushed stainless steel knife guides take the guesswork out of sharpening to a professional edge. This new combination of Chef’sChoice 220 knife sharpener uses 100% diamond abrasive discs for both sharpening and honing stages. It employs innovative CrissCross® technology, to create extremely sharp knife edges quickly. Stage 1 electric sharpening includes a coarse-grinding diamond disc that removes nicks and resets the blade to the desired angle. The Stage 2 micron-size diamond abrasives sharpen your knife blade to a precision edge. 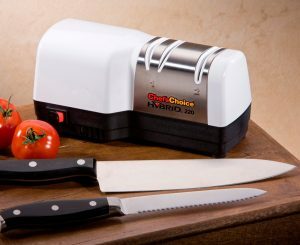 This Chef’sChoice 220 sharpener is a sturdy and versatile combination knife sharpener that safely sharpens all blades, from thick to thin, from straight to serrated, to a high-quality 20-degree, arch-shaped edge. It bevels a razor edge on a kitchen, pocket, and light-sport knives, as well as serrated bread knives. This advanced hybrid knife sharpener is made in the USA and comes with a 1-yr. limited warranty. The Smith 50364 Pocket Pal X2 knife sharpener is an advanced version of the current Pocket Pal portable knife sharpener. The Pocket Pal X2 is a durable, lightweight, compact, outdoor knife sharpening tool like its predecessor, with additional features specially-designed for hikers, campers, and other outdoor and sports enthusiasts. The durable Pocket Pal X2 knife sharpener has coarse carbide and fine ceramic pull-through sharpening slots. It also has a retractable, tapered diamond rod. Pre-set sharpening angles ensure quality sharpening every time. The fixed-angle carbide stone removes nicks and restores your knife blade in a few swipes. The fixed-angle ceramic sharpening stone de-burrs and polishes your blade to a finished edge. The diamond serrated rod sharpens hooks and the finest-toothed serrated knife edges. All abrasive components are replaceable. 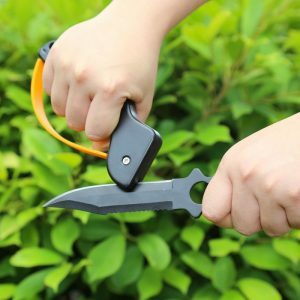 This Pocket Pal X2 knife sharpener is an outdoor tool that neatly fits on your belt or in your pocket. It includes a push-button LED light, compass, signal whistle, and fire starter. It bevels a razor edge on pocket, hunting, and fishing knives, serrated blades, gut hooks, and more. 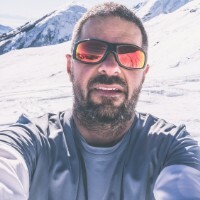 If you are looking for a knife sharpener specifically for your pocket or outdoor knife, you will want one that is portable, reasonably priced, and made of hard material that produces a sharp edge quickly that will last a relatively long time. Bench stones are portable, flat, single or double-sided sharpening stones. They are manually-operated whetstones or water stones, oil stones, or diamond stones. Whetstones are typically rectangular blocks. Most are double-sided (coarse and fine grits). They may be made of a natural material or they may be bonded abrasives (i.e. : ceramic, silicon carbide, or aluminum oxide). Bonded abrasives are more durable and provide faster blade sharpening than natural stones. They sharpen, hone, and finish a knife blade. However, they are better-suited to sharpening straight blades than serrated blades. It may also take practice sharpening knife blades to achieve a consistent angle. 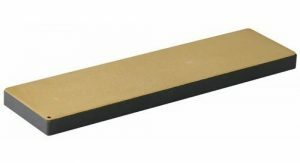 Oil stones are harder, very sturdy and durable, and less expensive sharpening stones. They require more time to produce a sharp edge and the oil makes the cleanup messier. Diamond stones provide optimum hardness, sharpen faster, and are the most expensive type of sharpening stones. Their long-lasting durability makes them popular with outdoorsmen/women and professionals. With a slight bit of water, they quickly sharpen the dullest edges. Coarse diamond is often used to flatten/reshape uneven whetstones and oil stones. Honing steels are primarily designed for the honing (straightening) your knife edge. Honing steels are lightweight, inexpensive, and portable, but they do not sharpen the blade, they just modify the edge of it. Some pocket knife sharpeners have honing steel rods in addition to blade sharpening angles. Electric knife sharpeners quickly and relatively effortlessly sharpen your knife. They are not portable, however, since they require a power source. They are easy to set up and operate and produce the sharpest edge for straight knife blades. They are not an inexpensive alternative, nor are they generally used to sharpen serrated knife blades. The most effective pocket knife sharpeners have a combination of abrasive materials for coarse, medium, and fine/ultra-fine sharpening stages. Diamond is the hardest and the most durable material. It produces sharp edges quickly. Diamond sharpeners (diamond-coated steel plates or rods) are more expensive. They are best-suited for repairing/resetting your blade edge but can sharpen and finish edges as well. Hunters and professionals prefer diamond sharpeners due to their durability and longevity. They do not lose their shape like whetstones and they require less maintenance. Tungsten carbide is twice the strength of steel. It is preferred for sharpening very dull pocket knife blades. Ceramic knife sharpeners are used for professional knife sharpening. They are preferred due to their water-, heat-, and rust-resistance. They are durable and made from high-grade corundum, silicon carbide, or alumina. The abrasiveness (grit) is the coarseness/fineness of the sharpening stone. It denotes the material’s ability to grind, shape, sharpen, or polish blade’s edge. Hard abrasive surfaces (i.e. : diamond) sharpen the fastest. Tungsten carbide typically has medium-quality abrasiveness. Ceramic surfaces are fine and generally used to polish edges to razor sharpness. Knife sharpening is done in stages. A coarse grit is used first for reshaping and to remove nicks. Medium grit is commonly used to sharpen blades. Fine to ultra-fine grit stones are used to finish and polish the knife blade. Knife sharpeners that have adjustable angles are easier to use and guarantee a better result. To get the best result, know what the best sharpening angle is for your particular type of knife and blade before you start. A good sharpener has safety features. A barrier or guide protects your fingers during knife sharpening. Manual sharpeners without guides and barriers work better in the hands of more experienced knife sharpeners. A solid, stable, and non-slip base keeps the knife sharpener in place during sharpening. You don’t want a manual knife sharpener to move, shift, or wobble as you pull the blade through the notch/slot. Do not put too much pressure on the knife as you pull it through the sharpening notches toward you. Pull consistently and in deliberate and slow strokes. 1. Question: How to use victorinox pocket knife sharpener? 2. Question: How to use gerber pocket knife sharpener? 3. 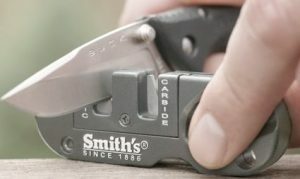 Question: How to use Smith's PP1 pocket knife sharpener? Pocket knives are convenient, portable all-purpose tools. A dull pocket knife does not serve its purpose and can become a hazard if it slips when you apply pressure in an effort to cut. To ensure you get the very best results when you use it, as well as for your safety, regularly hone and sharpen it. A well-maintained knife serves you well and lasts longer. Knife sharpeners remove nicks and reset and sharpen your blade to a razor sharp cutting edge. Portable, handheld, pocket sharpeners are the most convenient when you’re in the field and are preferred by many hikers, campers, hunters, fishermen/women, etc. Countertop electric sharpeners are easy and fast, but lack portability. The “best pocket knife sharpener” is lightweight, sturdy, compact, and sharpens straight and serrated knife blades. From those reviewed the Lansky PS-MED01 BladeMedic and Smith’s PP1 Pocket Pal or Pocket Pal X2 comparably meet basic criteria and are ready-to-use anywhere, anytime. Each of these sharpeners has (coarse grit) carbide and (fine grit) ceramic stones for sharpening and polishing, plus a retractable diamond rod for sharpening fish hooks and serrated blades. 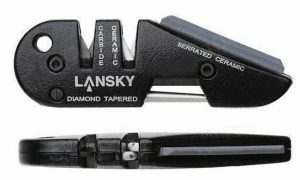 Lansky additionally advertises a manufacturer’s warranty. The Smith Pocket Pal X2 offers additional survival features such as a flashlight, compass, whistle, and lighter/fire starter. All Lansky and Smith products include the required CA Prop 65 disclaimer.